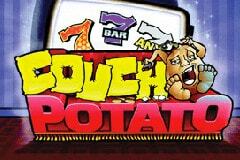 Couch Potato is an online pokie that takes its name quite literally and is themed around a sleepy spud which is having a rest on the sofa. Like many 3-reel games of this nature, there’s not much else related to this, other than one of the symbols and the main image, as the majority of the symbols are classic bars, 7’s and cherries. This makes it an easy game to enjoy, and one that has some decent payouts, so anyone who doesn’t feel like moving off the sofa today could spend some quality time spinning the reels of this game. In between naps of course. One thing that may wake players from their slumber is the bright colour scheme which seems somewhat at odds with the image of resting root vegetable, but it certainly makes Couch Potato stand out. The screen is packed with information about what symbols will equal what prizes, while the Potato himself is pictured below the 3 reels, which come with a single payline. Players get a prize when the reels come to a rest and a winning combinations runs across the middle of them. Along the bottom of the screen are the control buttons, and all players need to do is decide how much they want to stake on a spin. They can start from as little as 0.25 and for this, they will be activating a single coin. Using the + and – buttons, coin values can be increased to 0.50, 1.00, 2.00, or 5.00, and they can use 1, 2 or 3 coins per spin, for a total maximum bet of 15.00. The rather fussy-looking paytable has 3 columns of payouts and which one is lit up depends on how many coins the players have activated, but for the purposes of this exercise, we shall assume only a single one is in play, and in general the wins are paid out at the same ratio to bet amount anyway. One factor that makes Couch Potato stand out is the sheer number of symbols that are in play. While most 3-reel pokies make do with 7 or 8, there’s no less than 11 here, which can make it a bit confusing, or a little more interesting, depending on your point of view. From the bottom up, we have the traditional cherries, with a single example on the payline being worth a win of 2x the coin value, while 2 cherries at once, or a line made up if any of the bar symbols, are both worth a 5-coin payout. 3 cherries, or the single bar icon right across the line will reward players with 10 coins and then we move up to the double bar and triple bar symbols which will equal 20 or 30 coins. In between these the only special symbol of the game makes an appearance. The Couch Potato logo, suitably displayed on a TV screen will pay players 25 coins if 2 examples appear on the line, and we will return to this icon in a minute. Before then however, are the ‘7’ symbols, which take positions near the top of the payout schedule, with a line of silver 7’s worth 40 coins, blue ones are at 50 coins and the flame-effect 7’s pay 60 coins when they are across the line. The Couch Potato logo makes a welcome re-appearance at the very top however, with a full line of them worth the jackpot payment of 2000 coins. This is the only symbol where activating 2 or 3 coins will make a difference to the ratio of winnings, as players with 2 coins will get a 5000x prize for this combination, while playing 3 of them will result in a jackpot of 15,000 coins, which at maximum bet will equal a prize of 75,000.00. This symbol is also a wild, so it will count as any other to help complete extra wining combinations. On top of this, any payouts will be multiplied by 5x the base value when a single wild completes the line, and by a very generous 15x if 2 wilds and a single symbol come to rest on it. Can Players Have Their Chips and Eat Them? Couch Potato is a good example of a fun 3-reeler that has much going for it. Like all these games, it’s best not to concentrate of the theme too much and just enjoy the potential for lots of wins. Maybe it could do with a few less symbols, but that’s really just a matter of personal preference and if you’re happy with the multitude of icons that decorate the reels, then this is a game that has lots to enjoy.